I advise many companies on technology, the Internet of Things (IoT), their digital strategy and the challenges and opportunities of our increasingly digital future. Unfortunately, what I see repeatedly is people jumping on the path to IoT without fully thinking it through. This may be because when some IoT solutions are sold, they are portrayed as simple products with “guaranteed” ROI. However, what most suppliers are actually selling is a piece of a puzzle, where the value is only extracted when you have the full end to end service understood, adopted and embedded in your operations. I think we need to be clearer about the path to IoT and digitisation to ensure businesses have a clear understanding of the journey they’re undertaking. There is no doubt in my mind that businesses and cities are on the verge of a massive shift to the IoT. Further, this will be of critical strategic importance as they uncover the potential in revenue growth and innovation. Having spent many years embedding new technologies in large and small companies, on the demand side as well as the supply side, I wanted to shed some light on the “journey” towards the IoT. It’s good to begin with a simple reminder that the internet as we know it already is the “Internet of people” as it connects people to other people. In contrast, the “Internet of things” connects things to other things or devices to devices or machines to machines. Basically, any sensor, actuator, or device that you can attach a chip to becomes internet connection ready. With some tailored functions and coding this “connected” device can perform certain input and output tasks as part of a larger system level approach. Millions and millions of devices already connected to the IoT- including things we use or experience every day. A few examples are: baby monitoring, wearable devices, Smart TV, alarm and camera security systems, pollution & noise monitoring solutions, water leak detection, waste bins, building management systems, air conditioning units, irrigation systems and many others. 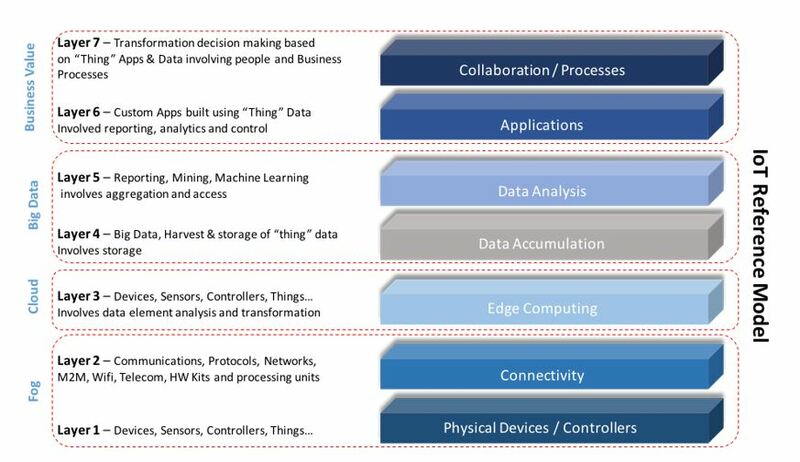 To do this well requires extensive analysis and the reference architecture image below highlights the many layers or interconnectedness and complexity required to successfully roll out an IoT solution. You can undertake this work in house (although I would not recommend it) and carefully consider each layer or you may choose an end to end IoT solution that meets your need. Either way, you will need to consider all of these levels in detail. For many organisations, it makes sense to look for a 3rd party IoT end to end solution typically offered as a SaaS model. Many organisations begin the journey to implementation with a pilot project on the side without disrupting or involving the wider business. However, if you truly seek to scale up and capture the full value potential, you better be ready to understand how to scale it up and embed it throughout your organisation – as far and wide as you can. To do this, your digital agenda must be incorporated into the business as a strategic decision and core belief or your IoT ambitions will quite possibly end up dying and causing more damage than adding value. Organisations must be willing and fully committed to change as part of this digitisation. The key areas to revisit and adapt for this journey are people and processes. IoT adoption is a critical change management challenge and journey for a business or a city – don’t make the mistake of thinking it’s a “bolt-on” to your existing model. It could well require a completely new business model to enable you to fully unlock the benefits. Whilst we may lament how quickly smartphones and the Internet have become embedded in our daily lives, most of us recognise that the world has changed and further technological progress is inevitable. Our choices as cities, businesses and individuals are the same: do we rail against this progress (and risk being left behind or becoming “redundant”) or do we embrace and adopt change, learning and transforming to take every advantage technology can bring? The World Economic Forum estimates that the number of connected devices will grow from 22.9bn in 2016 to headline-grabbing 50.1bn by 2020 – equivalent to almost five connected devices for every person on the planet. Over the last few decades, businesses have moved towards data-driven decision making. In the past when the cost of data was too high we sought more affordable ways and economised on the amount of data needed to make such decisions, especially in critical functions and processes. The Internet of Things (IoT) will transform your business no matter what it is, by providing business insights, improving business process and connecting you to your customers. IoT projects are often about transformation—moving from selling products to selling services—and effectively measuring ROI is key to success. The true value of the IoT lies in the data – not the sensors or collection of the data. The analysis and insights from data will allow consumers, businesses and even entire connected cities to run more efficiently than previously possible. In the future, this will evolve further incorporating artificial intelligence and machine learning. Recent research by Gartner and McKinsey came to the conclusion that IoT will create an economic impact in the next few years estimated to be more than 15 Trillion Dollars. It is critical that all business leaders realise the IoT is here to stay and that EVERY business and industry is already in the process of being disrupted. If you think your business will not be disrupted, there’s a danger that you may already be in trouble. In upcoming posts, I will talk about how to choose your IoT solution provider and what should you consider when you make your leap.